To offset the costs of running the Silicon Valley Speechwriters Roundtable I’m holding a raffle for three great prizes of interest to speechwriters. Tickets are just $10 each for members who would like to try their luck and support the Roundtable by buying tickets in this virtual raffle. There’s no charge to join the Roundtable, and anyone with an interest in speechwriting and tech is encouraged to join us — no matter where in the world you live. All Roundtable conference calls are free. To support the raffle click here. Counselor, by Ted Sorensen. In my review I noted that there’s over 500 pages of compelling narrative in his striking honest autobiography. It covers his Unitarian origins in the soil of Nebraska, to Washington DC and the Kennedy years, to the recent past … The book contains a fascinating number of insights into speechwriting and the role of the speechwriter. 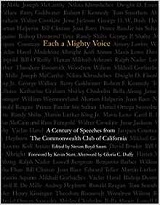 Each a Mighty Voice: A Century of Speeches from the Commonwealth Club of California. If you live in the San Francisco Bay Area, you have likely heard of The Commonwealth Club of California from its radio broadcasts. This book is a centennial collection of speeches delivered at the Club. Rich with ideas, sweeping in scope, Each a Mighty Voice immerses you in the anguish, excitement, and fears of the last century: not as history, but as present tense. The West Wing: Season 5. Experience the inner workings of the White House in this innovative, multi-award-winning drama series created by Emmy winner Aaron Sorkin. 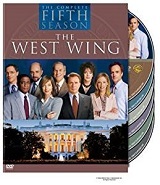 Martin Sheen, as President Bartlet, continues to leads an acclaimed ensemble cast.Entering its fifth season, The West Wing begins as the President — and the nation — faces the traumatic kidnapping of his youngest daughter, and that it may be the result of his controversial political actions. Watch this season and enjoy the vicarious thrill of speechwriting in the pressure cooker that is the White House.